The Samsung Galaxy Fold is scheduled to be released on April 26. Even before its release, reports suggest this $2,000 foldable phone might develop display issues over time. Is the leaked video showing the Galaxy Fold display issue real? Samsung first unveiled its much-anticipated foldable phone on Feb. 20 alongside the Galaxy S10. However, at the time, it didn’t allow anyone, including members of the press, to have any hands-on time with the device. The phone was also on display at the Mobile World Congress, but it was secured in a glass box. Samsung has released some teaser videos and the official renderings of the device. However, since they are from Samsung, we cannot expect them to reveal any issues. Thus far, there have not been any real-world interactions that could reveal the phone’s strengths and weakness. However, a new hands-on video supposedly showing the Galaxy Fold has surfaced. 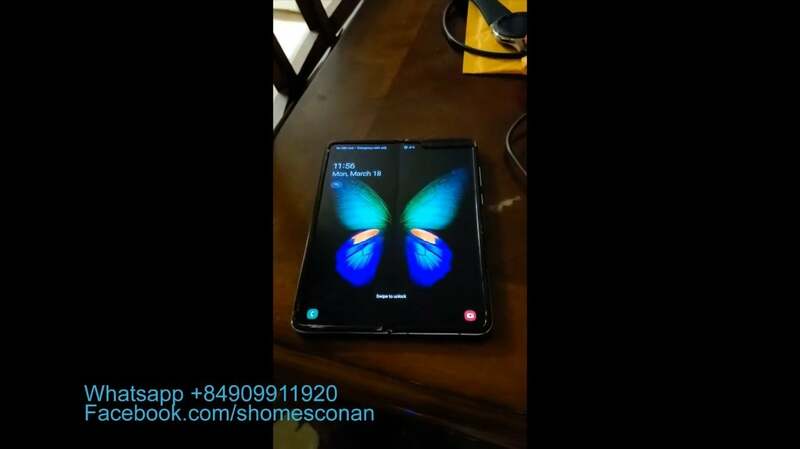 The video purportedly reveals a Galaxy Fold display issue that many previously raised concerns about. The Galaxy Fold display issue reportedly causes a crease to develop over time from folding and unfolding the phone numerous times. This video appears to show a working Galaxy Fold unit with a crease down the middle of the display. It is in the same area where the handset folds inward to take a compact shape. The video was posted on the tech YouTube channel phoneoftime, and it also reportedly show the Galaxy Fold in actual real-world usage. The video certainly looks real. According to SamMobile, it originates from Vietnam, where Samsung carries out a lot of its R&D work. The company also manufactures many of its phones in Vietnam, including its flagships. The phone in the video looks similar to the one Samsung showcased. Thus, it is very possible that one of the Galaxy Fold units has slipped out into the wild. The handset shown in the video appears to be an AT&T-bound variant. Samsung’s Galaxy Fold uses its new Infinity Flex display, which is coated with plastic. It is possible for plastic to develop creases over time. Most non-folding phones use glass displays. Bloomberg reported the same issue earlier this month. The news outlet said Samsung was working to fix the Galaxy Fold display issue and that the phone’s display starts to show signs of creasing after being folded and unfolded about 10,000 times. Thus, if you fold and unfold your phone about 50 times a day, your $2,000 foldable phone’s display would start to show some sort of crease in less than a year. However, Samsung reportedly claims the creasing issue might show up after flexing the display over 200,000 times. The company is said to be considering a free display replacement program for owners to fix the creasing issue. Samsung told Bloomberg that not allowing hands-on time with the Galaxy Fold was not because of any issues. Instead, the Korean firm said it didn’t want to take attention away from its Galaxy S10 phones. Samsung could also be working to enhance the durability of the plastic-coated display. However, considering that the foldable phone goes on sale next month, the Korean firm doesn’t have much time to make such changes now. Samsung is expected to reveal more information on its foldable phone next month. The Korean firm will hold a press event a few weeks before the launch event to provide a closer look at the handset. “At the beginning of April we’ll have a full press event,” Kate Beaumont, director of product, services, and commercial strategy at Samsung U.K. told The Verge at MWC. Samsung suggests that supply of this ultra-premium handset, which is priced at $1,980, will be limited at launch. Samsung’s strategy of limiting initial supply is similar to what Apple adopted for its $10,000 Apple Watch Edition. “This is a super premium device, and we want to make sure it has a concierge-like service and experience, so it’s not going to be on display in all stores. You’re not going to see it on the stands, we want to make sure it’s a very personal experience. There will be quite intensive aftercare that goes with it as well,” Beaumont said. Samsung’s Galaxy Fold has a 4.58-inch HD+ external screen and a 7.3-inch QHD+ Infinity Flex display. The handset is powered by a Snapdragon 855 chipset, features six camera lenses, and is fitted with a 4,380 mAh battery. It comes 12 GB of RAM and 512 GB of UFS 3.0 storage. Samsung’s foldable phone runs its Android Pie-based One UI.